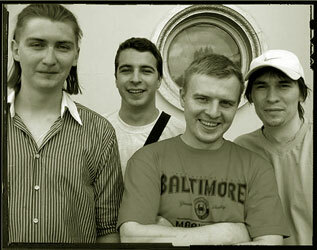 Alexei Ivanov (guitars, vocals, keyboards), Dmitry Bulavintzev (drums, percussions) and Konstantin Isaev (accordion, guitars, keyboards) from Bryansk have been in a band since 1996. They produced seven cdr-albums under the name TEATR TENEI; changed the name to YAZYK DOZHDYA in 2005 and followed the path with three more releases. All aforementioned self-produced and unfortunately little known albums featured song-oriented indie-rock with lyrics sung in Russian. Things changed greatly in 2007 when the bandmates, this time as RAIN TONGUE, appealed to instrumental forms of music building a fanciful bridge between melodic art rock and dreamy post-rock. 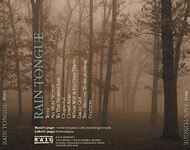 For music samples and booking please visit RAIN TONGUE MyspaceMusic page. "The opener 'Terra' indicates the general direction, offering moody post rock with magical female chants accompanying the soothing instruments. The short 'No More Secrets' paves the road for the nine minute long 'To The Nearest Song' which features a male-female mixed choir that proves that quasi-instrumental music can have a regular fairytale atmosphere without sounding cheesy. Other highlights are 'Cloud Atlas', with eight minutes another long track, and 'When Will It Fly Over Them'. Both tracks feature an accordion part. The former uses this instrument to instil a certain melancholy, while the latter shows a friendlier face of it. The album ends with the twelve minute long 'Feathers' and the conviction that post rock does not always have to come with apocalyptic moods. Rain Tongue’s self-titled label debut is a professionally crafted instrumental album that features contemporary sounds that should appeal to fans of Sigur Ros, Mogwai and the likes. At times the band surprises with stellar moments that the nearly one hour long record can’t sustain throughout. Still a nice addition to any well sorted sophisticated music collection. (Grade: 7/10)" – by Pascal Thiel of DisAgreement (Luxembourg) (September 2009). "Rain Tongue has delivered a stellar opening statement that not only highlights their superb musicianship, but also reveals their exceptional dedication to the art of crafting well thought out songs that encompass the entire emotional spectrum. (Score: 4/5)" – by Ryan Sparks of Sea Of Tranquility (USA) (November 2009). "The album is very relaxing, although steers well clear of any ambient/new wave territory being far more interesting and dynamic... 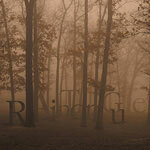 If you are into melodic, instrumental music then Rain Tongue are certainly a band to keep an eye out for. (Conclusion: 7.5 out of 10)" – by Mark Hughes of DPRP (UK) (April 2010). The album was also reviewed at: Progressive Area (France), Metal Library (Russia), Progwereld (The Netherlands), Metal Library's interview with Rain Tongue (Russia), Far From Moscow (USA), Music Waves (France).